Manolo says, above you see the handsome dark navy and cream, mary jane pump from the Marc by Marc Jacobs. And yes, the Manolo has already announced that 2008 will be the “Year of Color“, but as is so often the case, there is the counter trend to the main trend, running in opposition. So, for the example, the vertiginous platform heels of the last spring were countered by the Torey Burch ballet flats. 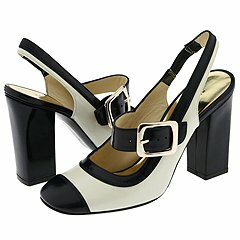 This year the counter trend to the colorful shoes are the shoes which combine white with black (or navy and cream, or other variations). Here are the other example, the Stuart Weitzman peep-toe pumps. Previously, Shoe Trends 2008, Part 1, Shoe Trends 2008, Part 2. This entry was posted on Thursday, January 31st, 2008 at 4:06 pm by Manolo the Shoeblogger and is filed under Marc Jacobs, Pumps/Court Shoes, Shoes, Stuart Weitzman, Trends. You can follow any responses to this entry through the RSS 2.0 feed. Both comments and pings are currently closed. A revival of the spectator pump is something I can definitely get behind! Love them all. agreed! I love them all! I love spectators! I have a pair of vintage ones. They make me feel like a dashing, daring gun moll form a 1940s noir. Nothing beats a spectator pump. I had a second grade teacher in (ahem) 19…, well, we won’t go there, but she had spectators in every color imaginable and all in the same style (I would not put it past her to have gone in, tried them on and just ordered one of everything they had in that size). My first pair were brown and white, in 1976. I wore ’em with a brown with white pin dots two piece dress and thought I was pretty hot stuff. Those shoes got retired, but it’s obviously time to start the hunt for new ones now. Terrific. Like I need an excuse to go shoe shopping. Must. Have. Peep-toe spectator pump. Must. Have. Oooooh, so classy yet still very ‘oo, look at my shoes’. I love them!